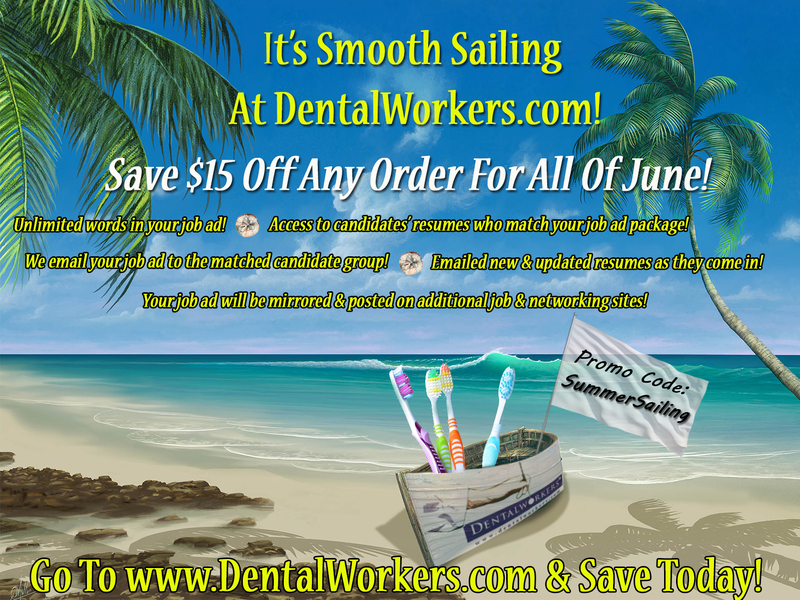 Save $15 Off ANY Dental Job Ad Package Order For The Entire Month of June! Have Questions About Your Dental Job Order? Happy Summer, everyone! We trust you had a wonderful Memorial Day holiday, and as we look forward to June, we realize that there is still a steady flow of graduating dental workers who will be looking for dental jobs. DentalWorkers.com is therefore offering you a great, money-saving special for the ENTIRE month of June! Place ANY order with us – a Dental Job Ad Package or a text or banner ad order order, for example, and no matter what the price, save $15! Dental employers receive many benefits by investing in our dental job ad packages. We are a dental industry-specific job board, and our prices are much more competitive than other job sites out there that aren’t even dental-specific! • An unlimited-word dental job ad – say what you want to say and as much of it as you want, to interested dental workers! Need help writing the perfect ad? DentalWorkers.com is just a chat, an email or a phone call away! • Receive access to ALL dental worker resumes that match your job ad group! • Dental workers in your specific matched candidate group will automatically receive emails, informing them you are looking for talented dental employees like them! • We mirror and post your dental job ad, not just on DentalWorkers.com, but on additional job and networking sites! Take advantage of our June savings to post text or banner ads, too! Have your message be seen by thousands of dental workers and dental professionals on DentalWorkers.com! Don’t forget to enter promo code SummerSailing (one word) when you check out! Our primary goal at DentalWorkers.com is to match qualified dental workers with you, the dental employer. Visit DentalWorkers.com, or call us at 1-877-235 9855 to take advantage of this amazing saving's opportunity, today!